Background: One of the extensively studied antineoplastic agent is Thymoquinone (TQ). Recent studies show increased level of oxidized low density lipoprotein (oxLDL) among cancer patients. However, how oxLDL is involved in cancer cell survival and growth is poorly understood. 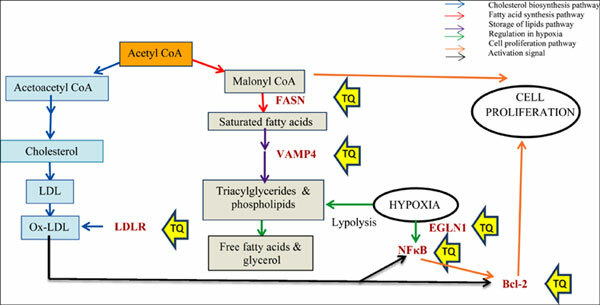 The goals of this study were to determine the molecular effects of oxLDL on breast cancer cell (MCF7) growth and how they are modulated by thymoquinone. Methods: A cytotoxicity assay was conducted to determine the IC50 value of TQ. MCF7 cells were exposed to oxLDL for 72 hours in culture, after which phase contrast images were taken. The characteristics of oxLDL-laden MCF7 cells and native MCF7 cells with TQ treatment were studied using proteomic and gene expression assays. Results: Microscopic images showed that oxLDL-laden MCF7 cells were larger than native MCF7 cells. Bright immunofluorescence staining indicated Bcl-2 expression in the cytoplasm and nucleus of oxLDL-laden MCF7 cells. Expression of fatty acid synthase (FASN) and LDL receptor (LDLR) was localized in the cytoplasm of oxLDL-laden MCF7 cells. Native MCF7 cells did not exhibit expression of these proteins. Further investigation showed increased expression of NFκB, Bcl-2, and LDLR in oxLDL-laden MCF7 cells compared to native MC7 cells. In contrast, FASN expression was lower in oxLDL-laden MCF7 cells compared to native cells. This could be due to availability of extracellular oxLDL and reduced de novo lipid synthesis. Relative gene expression analysis demonstrated downregulation of the EGLN1 gene in oxLDL-laden MCF7 cells, which indicates cell proliferation that is in line with higher expression in Bcl-2 and NFκB. Similarly, the VAMP4 gene was downregulated, which may indicate the presence of mature granules in oxLDL-laden MCF7 cells. Treatment with TQ inhibited expression of Bcl-2, LDLR and FASN but induced VAMP4 gene expression. Conclusion: Results of this study suggest that TQ modulates oxLDL-induced expression of markers in breast cancer growth. Oxidized low-density lipoprotein, LDLR, Bcl-2, breast cancer, thymoquinone, FASN, NFκB, VAMP4.